Roller Tire and Table Segment for Roller Mill | Product Information | KURIMOTO, LTD. 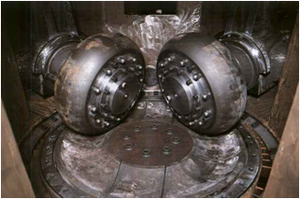 These are major consumable parts used at coal pulverizing mills for boilers and firing kilns. However, in recent years, longer-life parts have been required in order to reduce maintenance costs of these wear parts. 18Cr-based cast-iron material provides the top level of hardness through the effect produced by the proper mixing of C and Cr, special heat treatment, and addition of special elements. Thin-wall parts and thick-wall parts such as rollers do not lose hardness loss from surfaces to their core. Higher hardness but the same toughness as conventional high-chromium materials.